The Russo Brothers shot five different endings for Avengers: Endgame. Mark Ruffalo revealed the different ending situation during a new interview he participated in with Chris Evans and Karen Gillan. This isn't really too much of a surprise considering how seriously Marvel Studios takes its secrecy. During the production of Infinity War, the cast were not given full scripts and some of the information placed in the bits of script they received was fake. Mark Ruffalo says he shot five different endings with the Russo Brothers for Avengers: Endgame, but did not mention the other characters who were involved. The Russo Brothers and the cast are now out doing press for the upcoming sequel and everybody is being extremely careful not to spoil or leak anything. For some that's a pretty easy task, for Ruffalo, it's near impossible. He explains. "I shot, like, five different endings to this movie. I didn't even get a whole script of this movie. I don't know why. The script I did get had dummy scenes in it. He (pointing to Chris Evans) gets married in this!" While we're laughing at the idea of Captain America getting married, it could actually happen. As Mark Ruffalo says those words, the camera pans away from Chris Evans and Karen Gillan, and points directly at Ruffalo's face. We're not able to see the reaction from the other two, but Evans then goes on to say Ruffalo is a liability for all of the spoiling he does. The Hulk actor seems unaware of his reputation, but he has to be kidding around. Avengers: Endgame is the most anticipated movie of the year and there have been many fan theories floating around. One of said theories focuses on Steve Rogers going back in time to reunite with Peggy Carter, while others are certain that the character will die. As for Chris Evans, he isn't saying much. During a recent interview, he was asked what it was like wearing the Captain America suit for the last time and he was careful in the words he chose. Evans prefaced his answer by saying "potentially," which is pretty much what all of the actors have been coached to say. 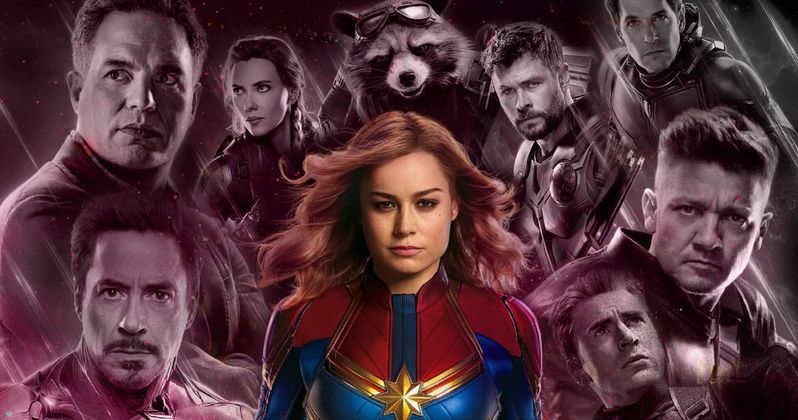 Avengers: Endgame is only a few weeks away from hitting theaters and it looks like even the stars of the movie aren't exactly sure how everything works out in the end, if it does at all. With that being said, will Marvel Studios really leave us with two grim movies to end Phase 3 of the Marvel Cinematic Universe? It sounds like they could very easily do just that, but we're going to have to wait and see what the Russo Brothers decided to do with one of those five endings they shot. You can watch the interview with Mark Ruffalo, Chris Evans, and Karen Gillan below, thanks to the E! Entertainment YouTube channel.